INDIANAPOLIS (AP) — A recording of dispatch radio calls shows that emergency workers were expressing concern about severe weather just minutes before winds ripped through the Indiana State Fair and caused a fatal stage collapse. WTHR-TV in Indianapolis obtained recordings of Marion County dispatch communications from the night of Aug. 13, when thousands of fans were waiting to see a concert by country music group Sugarland. The stage rigging toppled into the grandstand, and seven people died. In one excerpt, workers are warned about five minutes before the collapse that severe weather would be moving into the area in 30 minutes or less and are advised to "use your best judgment and find shelter when needed." Two minutes later, another radio user asks if concert fans have been released from the grandstands. The response: "I have no information on that, I will check and advise." Moments later, a 60-mph wind gust swept through the area, toppling the stage rigging into the grandstands. Four people were killed, and three people died later. More than 40 others were injured. An emcee had announced over the loudspeakers that severe weather was possible and told fans where to seek shelter if an evacuation was necessary, though an evacuation wasn't ordered. 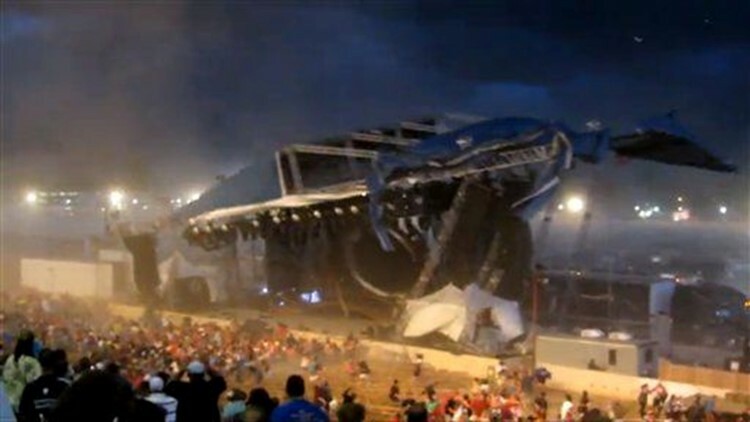 Fair officials have said they were preparing to order an evacuation when the stage fell. It wasn't immediately clear Thursday which agencies were using the county's radio system that night, though emergency medical service workers are referenced several times. Indiana State Police also are referenced, but a spokesman said state police weren't on the tapes. WTHR obtained the tapes through a public records request. Marion County didn't respond Thursday to a request for the recordings from The Associated Press, and a message was left for the county's communications chief. An attorney representing the estates of three people killed in the collapse said the tapes showed fair officials didn't take the severe weather seriously enough. "The tapes confirm exactly what we've been saying from day one: This was no unforeseeable event. It was predictable and preventable," lawyer Kenneth J. Allen said. Stephanie McFarland, a spokeswoman for the Indiana State Fair Commission, declined to comment on the tapes but noted a consultant had been hired to investigate how officials prepared and responded to the accident.